Montague Bellamy was born in Oxford in 1830/1, the son of Edward Bellamy, a bookbinder, and his wife Maria. He was not baptised at birth, but in 1840 Edward and his five brothers were all baptised at St Michael’s Church: Edward on 5 January together with Frederick, Arthur, and James, and then baby Septimus William separately on 4 March. At the time of the 1841 census Montague (11) was living in Friar’s Entry with his parents Edward and Maria Bellamy, and his younger brothers Edward (8), Frederick (6), Arthur (4), James (3), and Septimus (2). His father was a bookbinder. Zilpah Butwell was born in Minster Lovell in 1826 and baptised there on 9 July. At the time of the 1841 census she was aged 15 and living in Merton Street, Oxford and working as the servant of John Bruce (a groom at Merton College) and his wife. They had the following children:children. Frank Arthur Bellamy (born at 57 St John Street, Oxford on 17 October 1863 and baptised at St Mary Magdalen Church on 27 January 1864). At first Montague and Zilpah Bellamy continued living in Thames Street, but by 1854 they had moved to Albert Place in St Ebbe’s. By the time of the 1861 census Montague (30) and Zilpah (32) were living at 57 St John Street in St Mary Magdalen parish with their first four surviving children: Montague (10), Frederick (8), Zilpah Marquitta (6), and Ada Maria (4). When Zilpah’s mother Mrs Hannah Butwell died there at the age of 65 on 7 February 1869, a notice was inserted in Jackson’s Oxford Journal. Up until 1864, Montague was described simply as a bookbinder, but after that date he was also working as a college butler. At the time of the 1871 census he was still living in St John Street and employing seven people in the bookbinding trade, including his eldest son Montague (20). His next son, Frederick (17), was now working as a librarian, and Zilpah (16), Ada (15), Harry (10), and Frank (7) were also still at home. † Frederick Bellamy died at 44 Wellington Square on 11 May 1878 at the age of 25. He was buried in St Sepulchre’s Cemetery on 16 May (burial recorded in the parish register of St Mary Magdalen Church). May 11, at his residence, Wellington-square, Oxford, after a short illness, Frederick, second son of Montague and Zilpah Bellamy, Commoner of St. Mary Hall, and second assistant at the Radcliffe Observatory, aged 25. Three months later their son Montague junior was married. On 13 August 1876 at All Saints Church, Oxford, Montague Bellamy, then a bookbinder of All Saints’ parish, married his first wife, Mary Castell. By 1881 Montague Bellamy senior was a lodging-house keeper, living 44 Wellington Square (in St Giles’s parish) with his wife and three of his children: Zilpah Marquitta (26), Ada Maria (23), and Frank (16), who was a pupil at Magdalen College School. Their son Harry Ernest Bellamy (20), who had taken his brother’s place as Second Assistant at the Radcliffe Observatory, was in 1881 living with the family of his brother Montague at Kingston Road. He appears to have emigrated to the USA soon after that census (as he married Frances M. G. Machell in New York on 12 February 1884), and so in July 1881, just a few months before his eighteenth birthday, their son Frank Arthur Bellamy was appointed Second Assistant at the Radcliffe Observatory, the third of three Bellamy brothers to hold this position. 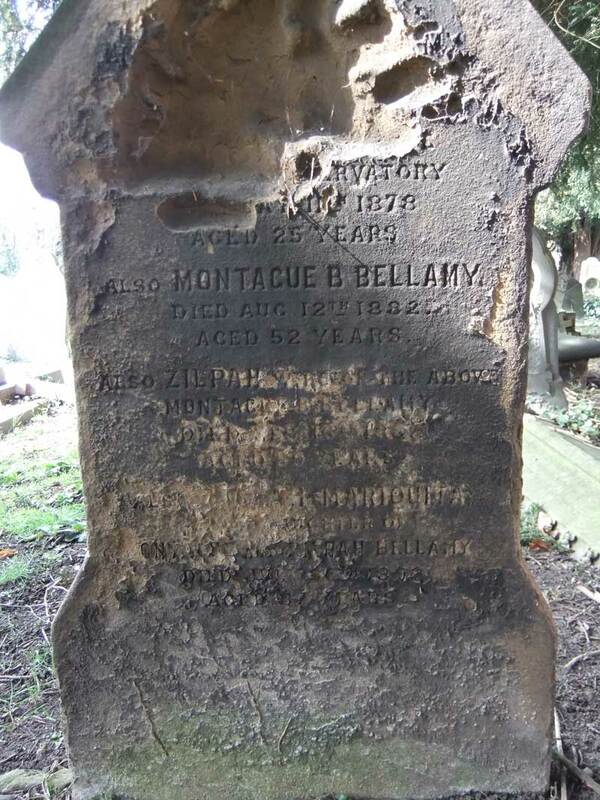 † Montague Bertie Bellamy died at 44 Wellington Square in August 1882 at the age of 52 and was buried at St Sepulchre’s Cemetery on 17 August (burial recorded in the parish register of St Mary Magdalen Church). † Mrs Zilpah Bellamy née Butwell died at 44 Wellington Square in February 1887 at the age of 59 and was buried at St Sepulchre’s Cemetery on 21 February (burial recorded in the parish register of St Mary Magdalen Church). Of their three sons, only the youngest son Frank was single and still living at home: so at the age of 22 he became head of the household and had to look after his two unmarried sisters Zilpah Marquitta and Ada Maria Bellamy. By the time of the 1891 census the three of them were living at 4 St Bernard's Road (then called St John's Road). † Zilpah Marquitta Bellamy died at 4 St Bernard’s Road and at the age of 36 on 30 July 1892 and was buried with her parents at St Sepulchre’s Cemetery on 3 August 1892 (burial recorded in the parish register of St Mary Magdalen Church).